A pair of senators is pushing the Obama administration to offer specifics on its proposed overhaul of security clearance processing, questioning whether the forthcoming agency tasked with heading up the project is actually implementing meaningful change. Sens. Claire McCaskill, D-Mo., and Jon Tester, D-Mont., wrote a letter to the Office of Personnel Management this week to voice concerns with the lack of transparency in standing up the National Background Investigations Bureau. The senators said they were worried about the timeline of the transition and whether sufficient “operation and oversight” measures were in place. The Office of Personnel Management announced NBIB’s creation in January to address holes in the security clearance process brought to light by Edward Snowden’s document release and Aaron Alexis’ shooting of employees at the Washington Navy Yard. OPM also billed the change as a way to better protect personal data collected during investigations, which were hacked last year and compromised 21.5 million files containing personal information. In their letter, Tester and McCaskill said they wanted guarantees NBIB would not “simply be a new name” for the existing Federal Investigative Services. The lawmakers asked for specific documentation on how the agency would differ from FIS, as well as plans for funding, timetables, budgeting, an organizational chart, staffing needs including contractors and the pricing structure for clients. Aside from broad brush strokes highlighting modernization and operational flexibility, as well as emphasizing the Pentagon’s new role, acting OPM Director Beth Cobert did not at a congressional hearing in February lay out specifics of exactly how NBIB will differ from FIS. The Obama administration tasked the Defense Department with overhauling the information technology infrastructure to support NBIB. Tester and McCaskill asked for details on that progress and what services are being solicited from private contractors. They also asked whether NBIB will have the authority to hire and contract on its own, or whether OPM will hold onto that responsibility. The lawmakers requested details on how the investigations will change under NBIB and how the new agency will address the workloads expected when every clearance holder requires a reinvestigation every five years. They also asked which inspector general will audit the new bureau. 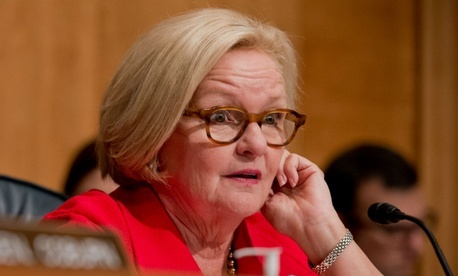 McCaskill previously introduced legislation to give the Pentagon’s IG oversight responsibility over NBIB. “We also agree that the NBIB should represent real change from the past, and we are committed to continue standing up NBIB in a way that strengthens how the federal government conducts background investigations and protects vital information,” Schumach said. He did not respond to a request asking whether OPM would answer the letter, or whether it would do so by the suggested deadline of June 17. Rep. John Mica, R-Fla., took his concerns even further.